MAGIC IS A TEACHING TOOL. You probably know two thirds of all students are visual learners. Those students—the majority in any school—are simply wired to respond better to a visual medium like magic than to classroom lectures. My name is Scott Green. I'm an assembly presenter who uses magic to make important topics engaging and help students retain what they've learned. That's why students, administrators, teachers and parents will be thrilled you chose me to present an assembly at your school. I turn magic into a visual aid that teaches bullying prevention, literacy skills, nutrition, or cultural arts history. Choose the theme that suits your school best or have me visit more than once. 1. On-point educational messaging set to your assembly's theme and delivered in an age-appropriate manner (the programs are presented differently to first graders than to seventh graders). 2. Retention-oriented messaging that focuses on making sure students retain what they learn long after the assembly is over. 3. Incredible magic, school-appropriate comedy and non-stop audience interaction. These three elements comprise the spoonful of sugar that makes the educational "medicine" go down. 4. A professional assembly presenter with the experience and knowledge to control hundreds of students. I'm nationally renowned in my industry as the author of a seminal book, Excellence in Family Magic. 5. A polished, professional performance complete with all necessary props and equipment, including theatrical backdrop and sound system. Please contact me right away. I'd like to answer any questions and add your school's date in my calendar. Make reading exciting. This assembly demonstrates the magical world of books and inspires students to read for pleasure. Create better student citizens. This assembly develops empathy and teaches the five steps bystanders can take when they witness bullying. With curriculum from the SPLC's Teaching Tolerance, the ADL's World of Tolerance and others, you can be confident this assembly teaches students the right messages about an important subject. To teach empathy and demonstrate how bullying victims can feel, a student is suddenly unable to lift a small cardboard box. NEW FOR 2017! Students learn actionable steps to prevent and stop bullying in your school. Magic is used as a visual aid to identify bullying; demonstrate the five steps for bystanders to help a bullying victim; help victims stand up for themselves in a constructive way; develop empathy; and more. Students K-8 will laugh until their sides hurt, participate throughout the show's 45 minutes and witness feats of mind-bending magic. And by the end, they'll have learned how to find great books at the library, the world of genres, fiction vs. non-fiction, and the value of a library card. Everybody will participate, everybody will laugh, and everybody will wonder at amazing feats of magic. And during this 45-minute assembly, K-8 students will learn how to identify which foods are likely to be high in sugar, how to use the MyPlate food groups, how to read nutrition labels, how to make positive snacking decisions, and why breakfast is so important. Nutrition can be a dry subject, but it doesn't have to be. With such an important topic, you'll be glad you commissioned The MyPlate Magic Show to make it fun. NEW FOR 2016-17! Students take a walk through history through the lens of magic, learning about the development of a millennia-old art form. Even your most jaded middle school and junior high students will be on the edges of their seats as they interact with the trick that quelled a 19th century insurrection against the French empire. They'll be rapt watching the Cups and Balls, a trick so old it's depicted in hieroglyphics on an ancient Egyptian tomb. They'll almost believe the impossible as they learn about a feud involving Harry Houdini, Sir Arthur Conan Doyle, phony spiritualists and Victorian England. Your students will discover with a newfound appreciation for the arts, and be curious to learn more about the historical periods and personalities brought to life during the performance. I literally wrote the book on performing magic for family audiences! My hysterical family magic shows are Chicago's best - that's why I'm ranked #1 on Yelp. Students and parents alike have a great time, be it family reading night, a school fundraiser, or whatever other event would benefit from fantastic entertainment. Choose my all-purpose show, The Better-Than-TV Magic Show; my Halloween show, "The Silly Spooky Magic Show," which has a light trick-or-treat safety theme; or my non-denominational "The Winter Show," a celebration of snow, presents and the spirit of giving. These shows are available during the school day or after. 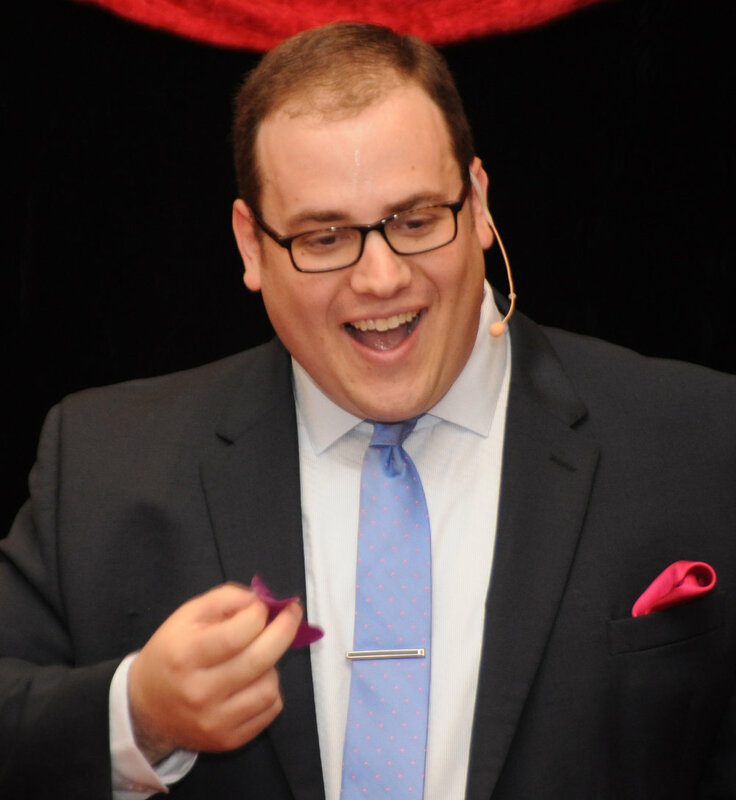 Pair one of my family magic shows with assemblies and two great things happen: first, attendance at the after-school event spikes as students drag their parents to see the funny magician from school today; and two, you'll get a great discount. You can have me for your school's family night - or you can settle for someone who merely read my book.